Special guests with the hotel management at the event: from left - Dew Surendra, Dushmantha Fernando (Head of Sales & Marketing at Pegasus Reef Hotel), Harsha Jayasinghe (General Manager of Pegasus Reef Hotel), Jayawardana Rajapaksha (Sous Chef at Pegasus Reef Hotel), Red, Malkumari Geetharani and Rukman Asitha. In yet another unique celebration that is now trademark to the Pegasus Reef Hotel’s trend of creating memorable and engaging events for hotel patrons, local guests and tourists, the city resort kicked off the holiday season with the mixing of the traditional Christmas cake, adding their own golden twist to the tale. 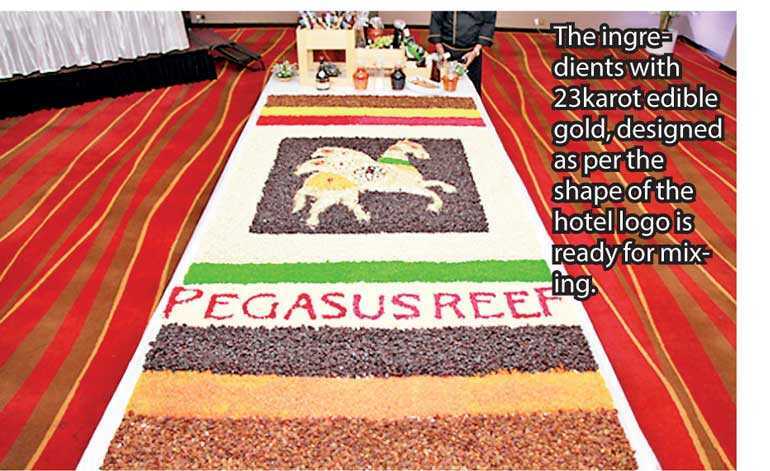 This year, the Pegasus Reef culinary team mixed 200 kg of cake ingredients, with the key ingredient being 23 karats of edible gold, making the Christmas cake mixing a truly ‘Golden’ affair. The culinary team, management and staff, together with the special invitees and guests gathered around the ingredients and officially made the start of the Christmas season. The celebratory and festive atmosphere was elevated with the tantalising aroma of vanilla and almond essence being mixed with juicy sultanas, cherries, raisins and other ingredients.